It seems that there are two kinds of hotelier out there. One who regularly tosses around terms such as technology, wireless, cloud based, integrated and software. And another whose vocabulary includes words such as old school, manual, analog, traditional and probably exhausted! A 2015 report by Software Advice found 25% of accommodation owners are still using pen and paper methods to record vital information and a huge 16% have no system at all. It may seem hard to believe that hoteliers would still be using archaic methods (or even no methods!) to manage their properties but really it’s not that surprising. Many buyers are skeptical that a Property Management System can really do the job better than they can and prefer analog methods that they feel are safer and more reliable. However, rooted in these beliefs are often misconceptions about current software and a lack of technical knowledge. It’s hardly surprising that this lack of awareness exists. Most hoteliers will admit to finding themselves time-poor and the idea of digesting technical terms, researching software and training staff to start using new methods feels like an impossible dream. However, with patience and a little effort hoteliers can find inspiration in emerging technology and free up time – yes folks, I said time – for other pursuits. For all you hoteliers ready to take the leap into the digital age, as well as to assist those of you who are thinking of overhauling an existing system, we are going to delve into the nuts and bolts of a Property Management System and what it can offer you today. We’ll take an in-depth look at the technology currently available and how it can help you unlock the full potential of your business. In this two part series we’ll show you how a system like Sirvoy can lend a hand especially with regards to what features a hotelier needs and which ones they don’t. It can be easy to fall into the comfortable trap of using only a small percentage of the functionality available to a PMS system so we’re going to try our best to really explain how best to select one and how best to make the most of your Property Management System once you have it. The features available to a PMS in 2018 are plentiful and it is almost impossible to compile an exhaustive list as they continue to grow at a proliferated pace. We recommend you keep the following points in mind when researching a system. A good PMS will provide your staff with an overview of what’s happening that day. This saves time and hassle, not having to click from one screen to another in order to get a birds eye overview. Make sure that your bookings are updated live via integrated channels. More on channels and integration later but this feature will mean you don’t have to duplicate work by having to re-enter information manually. It’s important that you choose a system that is easy to set up and intuitive for everyone to use. Cloud based is often the preferred choice here, as it’s updated automatically and allows for easier implementation. It’s vital that the system can be used by staff at all levels so if you’re not going to be the sole user it may be worth consulting one or two trusted employees to get their input before making a commitment. 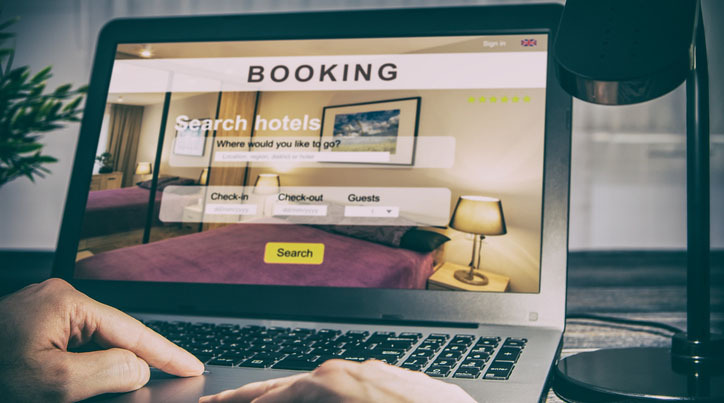 These are our top tips for hoteliers looking to find a booking system online. In the next instalment of this blog we’re going to look at four key areas you’ll need to focus on in order to make the best decision for you and your business. These are specifically related to the software and it’s user friendliness, the administrative capabilities, as well as facilities for booking management.